This bucket shaped hobo is covered in literally thousands of tiny rhinestones. Some might say it's too flashy, but by using dainty, delicate gems I think Kathy Van Zeeland gets away with being a bit excessive. I love the way the clear stones contrast with the bold blue synthetic, although I could have done without the angular zippered pockets. They offer convenient storage space, although won't be as practical to use as more traditionally configured pouches. But they interrupt the flow of the design, so perhaps they'd be better placed on the bag's plain back. The interior is spacious but not especially luxurious. I love the look of the pretty blue patterned lining, but its polyester finish feels a bit cheap. I also wish Kathy Van Zeeland had trimmed the pockets for extra strength, even if it was just in more of the synthetic. Still, we've got all the pouches we need and a secure zip closure, so perhaps we shouldn't be complaining too much. After all, Kathy Van Zeeland has kept the Dazzle Up under the magic $100 mark. At $99 it represents great value for girls who love to shine in the spotlight. 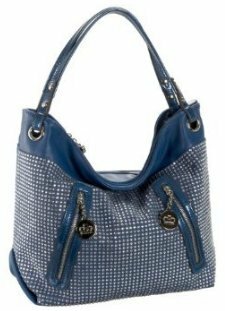 The Alexis Hudson Twinkle shoulder bag, a great alternative to this rhinestone bag.